In the 1850s the boot and shoe trade, strong in Northampton and growing in Daventry, came to the village. A number of entrepreneurs tried their luck here and for 150 years Long Buckby was to be an important footwear manufacturing village. Long Buckby has long been known for high class handsewn footwear, particularly long boots for horse riders. 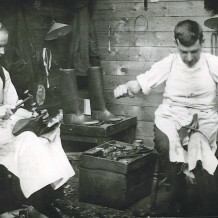 The skill of these craftspeople also meant that Long Buckby was the place to have bespoke and surgical footwear made. Its shoemakers have several times made the news as the only people able to make size 18 army boots or a pair of first shoes for larger children. 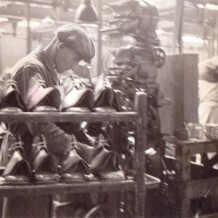 Long Buckby Shoes Limited had a large factory employing many local people, but much of the work was carried out in workshops in people’s back gardens. Clickers cut the uppers in one workshop and were passed on to be sewn in another then delivered to be welted in a third. Shoes passed round the community and were delivered to the factory for finishing at the end of the process. 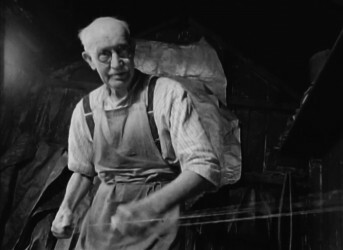 Although all the shoe factories had closed by the year 2000, there were still men in the village who could make a pair of shoes in their own homes. Many of the houses in the village still have the workshops used by these skilled shoemakers at the end of their garden. Long Buckby Museum now holds much material relating to the village’s shoemaking heritage.